Note that when Intel moved from 90nm to 65nm with its Smithfield to Presler transition, the 65nm core ended up being almost 79% the size of the older core. However when you take into account that transistor count went from 230M to 376M, all of the sudden the scaling looks a lot better. The bulk of that increase in transistor count was Presler's extra L2 cache, which happens to shrink quite well, so it's unfortunately not the best comparison. Looking at Prescott-2M to Cedar Mill, Intel saw very good scaling with a 40% smaller chip at 65nm (60% the size of the 90nm core). We weren't impressed with the power consumption of Brisbane at all in our first review; while it was lower than its 90nm counterpart, in many cases it wasn't all that much lower. Once again this is an issue of comparing a very mature 90nm process with AMD's first 65nm chips. You see, the voltages that Brisbane will be manufactured at range from 1.250V to 1.350V, with the coolest running, highest overclocking, least power consuming chips running at 1.250V and the worst examples running at 1.350V. Both of our Brisbane samples, the 5000+ and 4800+, ran at 1.350V. Note that our 90nm 5000+ ran at 1.300V, a lower voltage than the newer 65nm core. The fact that many 65nm parts aren't at much lower voltages yet is why the highest clocked Athlon 64 X2s are still 90nm CPUs, such as the 5600+ which runs at 2.8GHz. At some point in the future, AMD will hopefully be able to tune its manufacturing so that we will get lower voltage, lower wattage 65nm parts. This is also part of the reason why we encountered such dismal overclocking results with our 5000+. The 4800+ we tested fared no better, with our best overclock on stock cooling ending up at 2.837GHz (227 x 12.5) - not terrible for stock cooling, but not great either. The impact of higher voltages on power consumption also applies to Intel as well. As you will see in our power comparison, in a number of cases our Core 2 Duo E6300 required even more power than the E6600 we tested last time. The reason being that our E6300 sample runs at a core voltage of 1.325V vs. 1.2625V for our E6600 sample. Just things to keep in mind as you look at the power results over the next few pages. I was wondering if there was a way to PM or email you. I would like to bring to your attention a few concerns regarding the forum and the moderators that you need to be aware of. Is there an email or can I PM you in any way? I would appreciate your respond. Perhaps a weird thought but AMD bought that new ZRAM process that theoretically could put a huge cache on a small space with the flaw that it had so-so latency, then they later bought version 2 of the same but so far they didn't use it. Now what if this is an experiment with that technology, or a preamble, because at some time you would expect them to start using stuff they bought the license off, although at the time of the ZRAM announcement people were projecting use in a very far future that might not be what AMD has in mind, or the situation might have changed as to the performance of current versions of ZRAM. What do you think, any link to it? If you look,you'll see a story here in Anandtech.com for the first AMD X2s dated June 2005. The processor there was the 'top notch,for something unheard of in the processor industry. And even so doing with DDR400 memory. What is strange in these processor scenarios. There is Moores law. And there is the 'business quarter law. The article here,of wich I am commenting to,if the first of the detail in the "new processors"-the 65Nm processors. The AMDX2xs where also "new" when the 2005 articles was published. Today,as of reading this article,the "old"(and then top notch)is no longer being supported ..or as per use,no longer maintaining the subject cache sizes. AND well,point me if I am not correct,but the "old"processors are no longer going to be manufactured. Well I have usually considered that in these events of "new,and old"technology that somehow,if something is 18 months past.I can actually afford it. This changes a little with the new Intel setups. Since the Intel lineups finally seem to break this cycle of the previous as I explained here. For an entire year,I saw article after article,putting AMDs top notch as base line for performance. Ney user could address something of a culminating relationship to what had performance and what they could afford. And AMDs "top notch" an "industry standard" wich of course nobody could afford. At least if somebody was passing the buck,it wasn't happening with me. Annyway,I would just like to say I wish AMD good luck.Yet I cannot be ashamed to say that I can now put together a system for less than 1000$ with the same parts as that '"top notch"industry standard seen for the permiating part of 2005. Am I better for thinking that way ? 18 months passed,and my dollars are spendable but not supported ? 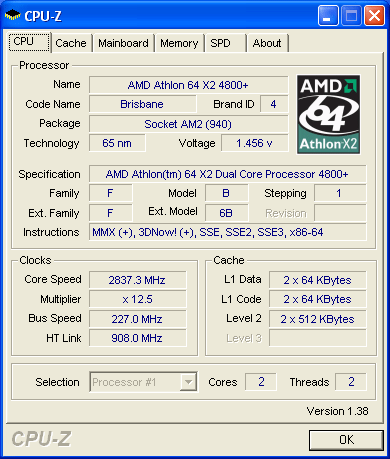 I dont think that anybody could consider an AMD setup a 'low-end setup if for example the 4800+1Mb l2 can be had for 230$. That is the enevitable consequence is the final exhaustion of the supply of the component. Yet I could say that I have a "top notch" 2005 version of AMD technology. With 2007 PARTS! Being on the exhausted end,I dont know who could feel better about this. Wish AMD luck. Still with their record,I probably should say that I do not wish to look forward to exhaustion,at the same time as extingusishment,as in the mentioning of taking a break to what one pays for. Anything cheaper is K8 vs. Netburst so Intel is no contender. For decent IGP-free boards the difference is comparable. Anand, can you test the 65nm K8 with lower res in games and a broader selection of games so we can more truely see the difference? The same power hog is 590SLI for AMD.